Over the weekend, Redwood Heights Elementary School had their annual Harvest for Learning School Auction. This highly successful event is entirely organized and hosted by Redwood Heights Elementary School parents and it raised over $50,000 for the school. This event takes months of careful planning and I am happy to be a part of the auction committee. This past October, Crocker Highland's Elementary School PTA hosted the Shades of Green Home Tour, showcasing the beautiful 1920's homes in Crocker Highland with a Green Garden Expo. (Click Here for more information on Shades of Green.) All of the proceeds went to Crocker Highland's Elementary School. 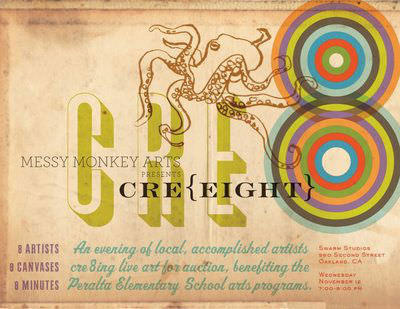 This Wednesday Messy Monkey Arts presents, (with the help of Peralta parents) an art show at Swarm Gallery to benefit Peralta Elementary School. Click Here for more information. Despite all of the negative media coverage, Oakland Public School District has great schools with great families.